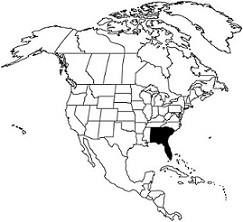 Range: Primarily in the state of Florida, but it also ranges to southern sections of South Carolina, Georgia, Alabama and Texas. It is the largest soft shelled turtle in North America. This species has a large dark olive-green colored carapace that can be 30 inches long. Females are larger than the males. The Florida softshell has a long slender neck and a slim, elongated snout. They spend most of their time in water occasionally emerging onto land to either lay eggs or to bask in the sun.